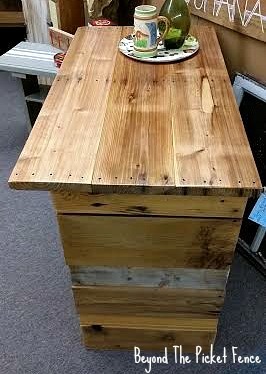 I really wasn't sure what I was going to build--stared at my wood pile in the garage for awhile, stared at the pallet wood in my workshop for awhile, stared at Facebook for awhile because it is an excellent distraction, and finally decided on a small bar/island/counter thingy. I started with 4 kind of 2"x 2" (not exactly that size--just random reclaimed boards) that I cut to 35". I then added notched pallet 2"x 4" 's to the 35" boards to make two rectangles. The 35" boards were on top of the notched pallet boards at the corners. 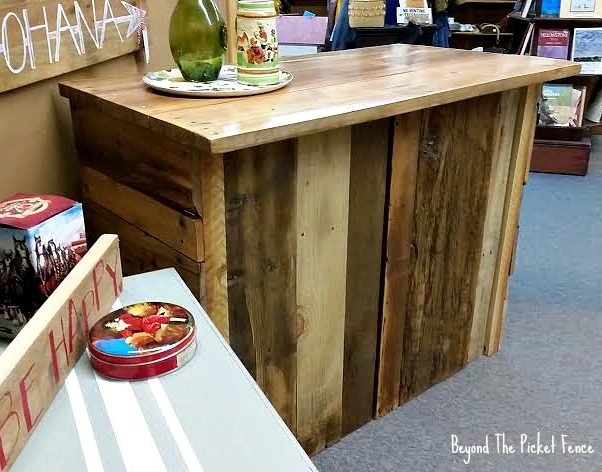 Using the nail gun, I added random salvaged wood pieces--old fence, pallet, barnwood, trim--to create the front of the bar. I then cut 20" pieces of random boards and created the sides by attaching the front to the other rectangle. I use screws to secure the top and bottom piece of wood on each side and then the nail gun for the rest. After that, a bottom and middle shelf were added on the inside. 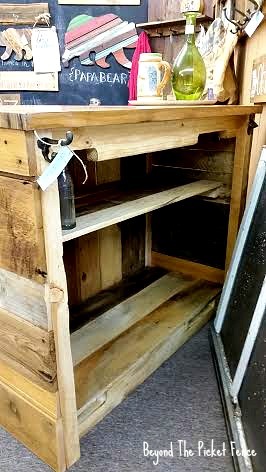 I used pallet boards for both of the shelves. 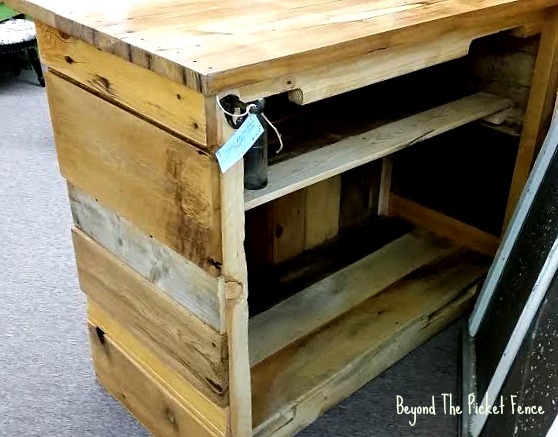 The top was also made from pallet wood--the biggest, chunkiest pallet wood I have ever found. These are 1 1/2" thick! Some sanding, clear Minwax polyacrylic finish, and a bottle opener and towel hook finished this rustic piece! 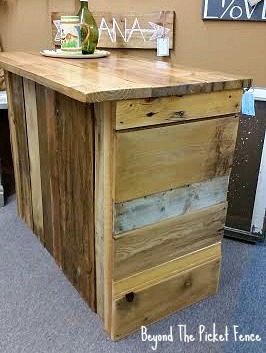 I would love it as a coffee bar if i had the spot for it. Or maybe a coffee bar by day, whiskey bar by night?? Nice Becky, as you know I love the stuff you make! Thank you Julie, it is an easy build! But, I do always surprise myself a nit that I have no plan and three hours later I have a piece of furniture. You are always so clever. I'll have a shot of whiskey please!